I've so many thoughts and ideas swirling around in my brain lately. And so many ideas for blog posts. Both new and old that I haven't quite hit publish on yet or haven't finished that I hope to someday hit publish on. So many things have changed for me over the years. Since I started this blog almost 3 years ago. Living with Anxiety: A post I started a few years ago. There are so many misconceptions about anxiety and panic attacks. I really wanted to write a post on what it's actually like to live and deal with anxiety and panic attacks on a daily basis. Also, as a sort of therapy for me. Writing and blogging are very theraputic for me. But, I am also a very personal person and wasn't quite sure I wanted to hit publish on this one. What 27 Taught Me: I was going to publish this when I turned 28. But, now I'm almost 30. So, I guess I will have to write what 29 taught me. Or what my 20's taught me in general since I'm no longer going to be in them. And yes my 20's taught me so much both good and bad. Why we need Sistership: No I'm not just talking about blood sisters. I'm talking about friendships. This was something I really didn't know a whole lot about. I was an only child except for half sisters. And I never really had any close girlfriends. But, this year I've learned a lot about sisterhood and friendship. And I joined my first sistership circle. The Queen: What she is teaching me: No I don't mean the queen of England. I mean the Queen archetype. Last month I learned a whole lot about the sovereign queen. Between my sistership circle and other women circles. Which I never even knew existed. With all these goddess divine feminine embracing women. Which, I started listening to in the summer after a very difficult time in my life. Which I will eventually write about. And now that I'm almost 30 I feel it's really time for me to step into my Queen. This year I feel like I've really grown up. A Fearless Heart: This post is about my grandma. I've written about her before . But, this year I feel like she's really been with me. I have her name as my middle name and this year more then ever I've embraced it. She was truly a fearless woman. So these are some of my unpublished or unfinished thoughts that hopefully one day will get posted. I think the more people share their experiences with anxiety and depression and other mental health issues, the better. Of course, I totally understand the difficulty of sharing these things, but I think in the long-term, it only serves to help as it gets more REAL information out there. I love the sistership idea too. Women attacking women, even subtly, is so destructive and all too rampant. Would love to see all these, in fact. Thanks for joining the challenge! Thank you Alyssa. 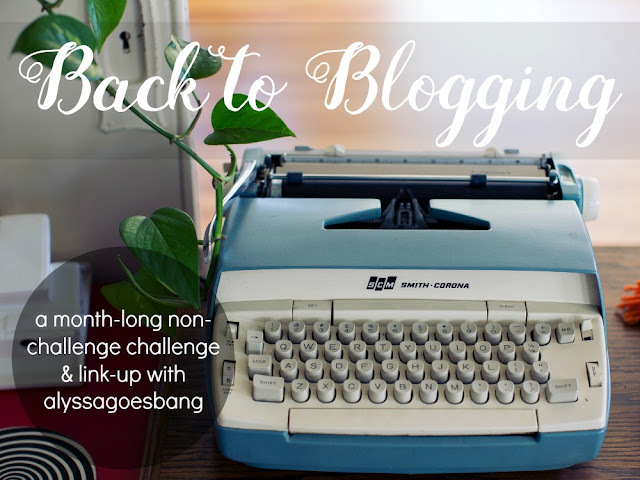 So glad you created the challenge since I've been out of blogging for awhile. So, it's nice to have a challenge to jump into it. I agree I think the more people share their experiences with anxiety and depression and other mental health issues the better. Yes women attacking women is so destructive and still happens all too often unfortunately.